American rabbi; born at Zirke, province of Posen, Feb. 19, 1838; educated by his father, who was rabbi of Zirke, by the rabbis Caro of Pinne, Feilchenfeld and Mendel, both of Rogasen, and later at the gymnasium of Gleiwitz and the University at Giessen. In 1858 he emigrated to the United States, where he founded the Congregation B'nai Abraham at Portsmouth, Ohio. In 1862 he became rabbi of Congregation Shaar Hashomayim, in New York city, and in 1871 of the Temple Israel, Brooklyn. In 1876 he accepted a call from the Congregation Ohabei Shalom at Boston, of which he is now (1904) rabbi emeritus. 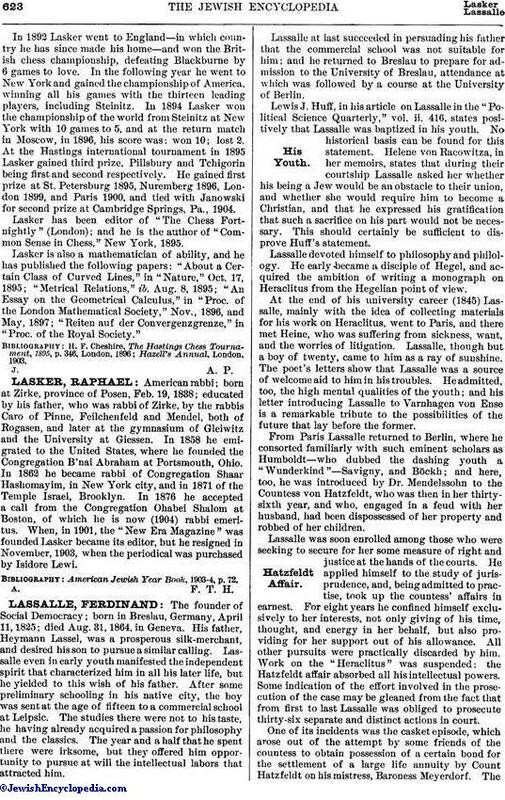 When, in 1901, the "New Era Magazine" was founded Lasker became its editor, but he resigned in November, 1903, when the periodical was purchased by Isidore Lewi. American Jewish Year Book, 1903-4, p. 72.